Is it just me? Or does something about the body language of the people in this photograph seem wildly inauthentic? Yes, the New York Times company reported a sharp drop in earnings this week. Yes, the figures for advertising revenue were wretched and getting worse. BUT, buried in the financial details, there is some potentially important good news: Money coming in from circulation is rising. In fact, it rose 6.5% in the first quarter of this year compared to the same quarter a year ago. Therein may lie the salvation of the most important news organization in the country. The reason is that “circulation revenue” is all the money coming in from the subscriptions to the traditional print edition, the dollars paid by folks picking up a copy of the Times at newsstands, and — most important of all — the money coming in from digital subscribers who bumped into the Times “paywall” and decided to pony up and pay for full access to the Times online. They are important because they are the future. In the digital era, the key metric is whether you can make money online. Historically, newspapers depended on a “dual revenue stream” of money coming from both circulation and advertising. For more than a century, both sources increased, and they fluctuated around a ratio of 50/50 in terms of total revenues. If the Times can continue to gain readers who will pay, then there is no reason it could not sustain itself mainly on the basis of its own readers — who are, ultimately, a better base for journalism than advertisers. Thank you, Tiffany and Bloomingdales, and may your ad spending continue. But ultimately, the Times might be better off if it were funded like the old PM newspaper, or I.F. Stone’s Weekly, or NPR, or the AP or other news organizations that do not depend on advertising. According to the latest figures, readers now account for a majority of the Times revenues. Here’s a chart from the company’s press release. So, it appears that “the people formerly known as the audience” are pointing the ( or a?) way forward. This chart (which I customized using a tool on the NYTCo corporate site) shows how the NYTCo stock has performed in the last six months, compared to the Dow Jones average, which has been on a tear. That’s the headline on a piece in the latest History News Network website, reporting the results of a flash poll of elite historians timed to coincide with this week’s opening of the new George W. Bush presidential library. Sixty-four historians responded. Thirty-five — over half — rated his presidency an outright failure. But Bush, famously unreflective, professes nonchalance. 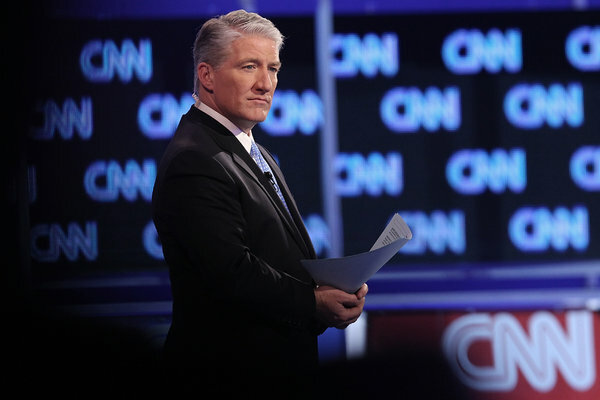 He spoke this week to CNN national correspondent John King (yes, the same John King who mis-reported a key part of the Boston Marathon bombing case). 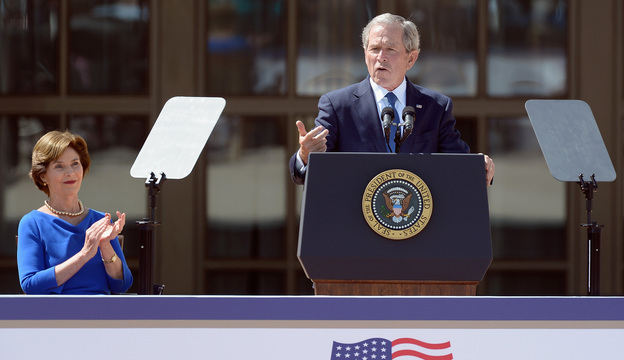 GEORGE BUSH: History will ultimately judge the decisions that were made for Iraq. And I’m just not going to be around to see the final verdict. GEORGE BUSH (laughing): In other words, I’ll be dead…. The bombing case: “Total Noise”? Gleick’s piece from New York magazine was also noticed by Maureen Dowd in her column today. She added value by actually taking him out for coffee and interviewing him. 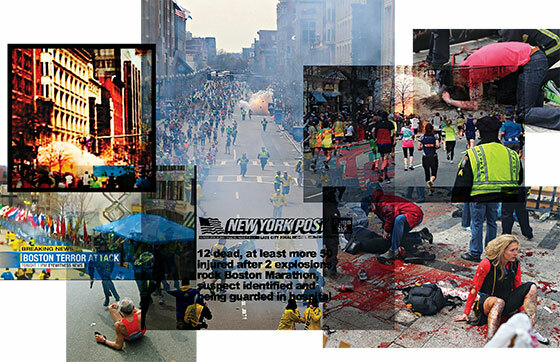 Photo montage by New York magazine (including photo by BU student journalism Kenshin Okubo). In his column in today’s New York Times, David Carr analyzes CNN’s self-inflicted wound caused by wrongly reporting the arrest of a suspect in the Marathon bombing case. In doing so, Carr makes some of the same points I made here last week in this post. The problem is how to gather news while the public is watching. There’s no real answer, of course, except for everyone to do better.